Put yourself on the wind swept hill above Caperneum and the Sea of Galilee. You have been following Jesus from town to town as he has been performing miracles to the amazement of many but to the consternation of some. Now Jesus has asked everyone to sit so we hear his timeless teachings on our relationship to God and to one another. In his Sermon on the Mount, Jesus offers his followers a way of life that promises an eternity in Heaven. 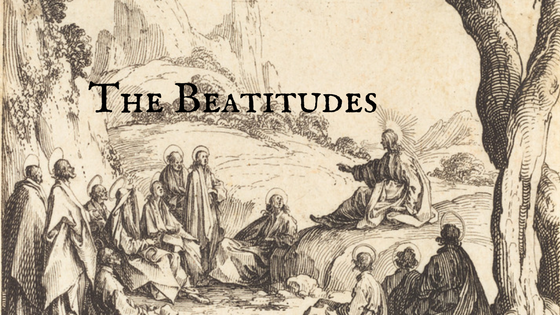 Please join me in exploring these teachings known as The Beatitudes. Jesus begins the Beatitudes with a statement that throws into question the direction of our striving hearts. Many of us build our lives stone by stone, thinking that our economic well-being will relieve our thirst for something more than the riches and real estate we may acquire through a lifetime of effort. But wealth by itself cannot quench our thirst or satisfy our longing hearts. The poor are blessed because they are less prone to be blinded by the smokescreen of riches that obscures God’s authentic role in this world. The poor are not blessed because they are better. God calls all men and women into relationship with himself. It is just harder for the rich to put their trust in God because they may have decided to trust in the power and position that wealth can bring. “A man who has riches without understanding is like the beasts that perish” (Psalm 49:20). When we experience the loss a friend or a family member, we cry out from the bottom of our hearts because we know something irreversible has taken place. We mourn, but Jesus tells us that God comes beside us to mourn with us and to comfort us. We are blessed at these moments because in the midst of our profound aloneness we experience the presence of God. And when we experience his presence, we realize that when we invite God into our lives, we are not alone and will never be alone. “I will never leave you nor forsake you” (Joshua 1:5). O Lord, you have searched me and you know me. If we hunger and thirst for something, we will not stop until we get it. What is your desert thirst? What do you hunger for above everything else? Jesus is using physical appetites common to all men and women to point to the one thing that will actually satisfy. Solomon asked God for the wisdom of “a discerning heart to govern your people and to distinguish right from wrong” (1 Kings 3:9). By asking for wisdom he was asking God to bless him with the righteousness that can only come from God. Jesus came down to earth to make that righteousness available to all: “Be reconciled to God. God made him who had no sin to be sin for us, so that in him we might become the righteousness of God” (2 Corinthians 5:20–21). As God has shown mercy to us, so we should show the same measure of mercy to others. In the Parable of the Unmerciful Servant, Jesus tells of a servant who cannot repay his master a large amount of money. The servant begs for mercy and it is granted. But soon enough, the servant demands repayment of monies owed him, and instead of showing the same kindness when the debtor cannot pay, he has the debtor thrown into prison. When the master is told of this, he asks the forgiven servant, “Shouldn’t you have had the same mercy on your fellow servant just as I had for you?” (Matthew 18:23–35) Think of the master in the parable as God, and think of the wicked servant as each one of us. We have received God’s mercy; in fact, we receive it everyday and we can never pay it back. But we can show it to others every time we have the opportunity. We can represent God in the world by forgiving just as we have been forgiven. If we have the means, we wash away the grit and grime that naturally accumulates during our daily engagement with the world. If we don’t go through the daily rituals of bathing, we begin to feel out of sorts. But outer cleanliness does not necessarily equate with inner cleanliness. Jesus compares the Pharisees to “whitewashed tombs, which look beautiful on the outside but on the inside are full of dead men’s bones and everything unclean” (Matthew 23:27–28). The unclean and diseased heart infects the whole person from the inside out, making it less and less possible to “see God.” Jesus is the ultimate heart surgeon who repairs and restores, beginning with the heart and working out from there. We hear people speak of peace all the time, but how can there be peace when, in the deeper recesses of the heart, we are often at war with God? It might be said that human history began with the rebellion in the Garden of Eden. One thoughtless act of defiance led directly to all the enmity, pain, suffering, murder, and mayhem that characterize so much of the historical narrative. Peacemaking, as opposed to peacekeeping, can only take root if we first make peace with God through Christ. Then genuine peacemaking can begin, one person at a time. From our earliest days, we expect to be rewarded for good behavior. When the opposite occurs, we feel the pain of injustice to our very core. This correlation of good behavior and reward is so pervasive that we often expect that our life will get better if we follow Jesus. But the weight of the narrative thus far suggests the opposite is just as true. Jesus’ life was threatened by Herod’s troops when he was a young child, he was persecuted and reviled by the religious elite for performing miracles on the Sabbath, and he was even rejected in his hometown of Nazareth. Jesus experienced persecution, his disciples experienced persecution, and the church has experienced persecution down through the ages and even to the present time. Want more? Sign up for my daily podcast with Pastor Chuck Davis that follows the life of Jesus as told in the four gospels. This entry was posted in From The Blog and tagged bible study;, caperneum, Chuck Davis, Eric Kampmann, four gospels, galilee, Getting to Know Jesus, God, gospels, how to get into heaven, Jesus, Jesus Christ, joshua 1:5, life of jesus, matthew 5, matthew 5:10, matthew 5:3, matthew 5:4, matthew 5:5, matthew 5:6, matthew 5:6; 2 corinthians 5:20, matthew 5:7, matthew 5:8, matthew 5:9, meek, mourn, psalm 139:1, sea of galilee, Sermon on the Mount, sermon on the mountain, the beatitudes; beatitudes, the meek, the merciful, the peacemakers, the persecuted, the pure in heart, those who hunger and thirst, those who mourn on March 29, 2017 by Alison.